Bootstrap - Web developer's best friend. For those seeking to create personal or business sites, Bootstrap HTML5 website templates are a blessing. Ready-made framework of CSS and HTML codes, responsive design and many more elements that make Bootstrap a boon for developers. 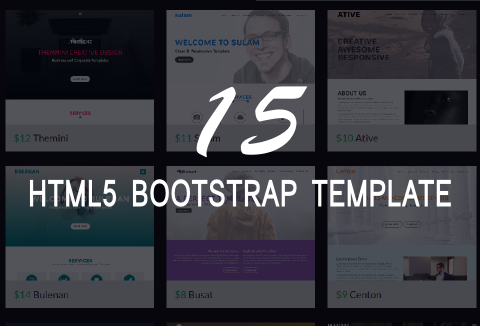 Get started on your own niche with this amazing HTML5 Bootstrap template bundle all ready for you to integrate into your glorious website! These templates feature cool HTML pages with multiple options. The layout adapts to different screen sizes with any device such as smartphones, tablets or desktop computers. This template is built using Bootstrap framework with stunning parallax effect. This template is perfect for corporate websites with it's elegant white and blue combination. This template combines soft black and white theme supported with a simple header to display information about company's products, pricing team, etc. A template with a top-down gradient header with stunning parallax effect. A template having a header with a text slider with stunning animation. This template is suitable for displaying information about company's profile, products using an elegant violet color. A responsive template suitable for business and corporate websites. A fully responsive template using a dark base color with soft white hover. This template is built using a modal menu, easily editable without any coding knowledge. This template is suitable for restaurants and cafes. It is a template with an extremely clean design. This template is perfect for corporate sites. The header text is built using sliders with charming animation. A responsive template with an attractive appearance perfect for promoting apps. A responsive template with unique triangular header and stunning parallax effect.